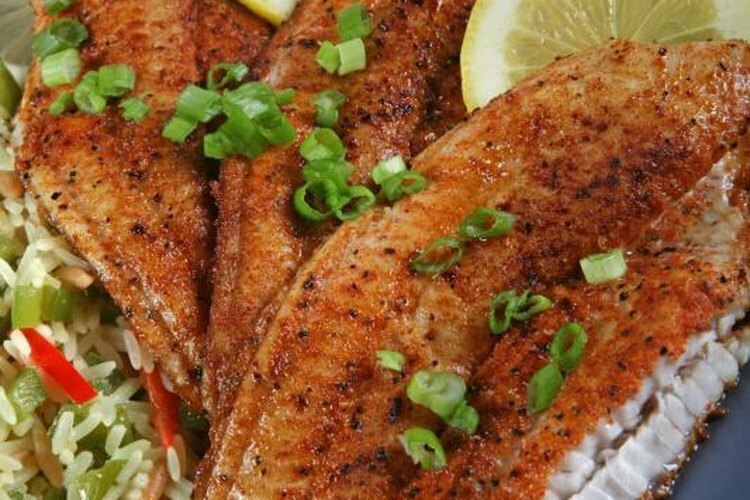 Catfish fillets are often baked or breaded and fried. Catfish are valued for their high quality, white meat. Channel catfish and blue catfish are among the most common varieties and are cleaned using the same techniques. Multiple cleaning techniques exist, but the most efficient is a simple fillet technique. Filleting the fish prevents the need for gutting and leaves you with meat ready to cook. Filleting in the field is ideal as the carcass is easily disposed and will not attract critters to your home. Set the fish on a table and position with the belly facing you. Place the knife with the tip above the dorsal fin and the base along the belly. Cut downward until you reach the spine. After you hit the spine, rotate the blade towards the tail. Maintain a slight angle into the spine and run the knife toward the tail. This will separate the fillet from the body. Stop cutting just above the tail. Do not separate the fillet entirely. Flip the fillet towards the tail, with the skin side on the table. Hold the knife at a slight downward angle to separate the meat from the skin. Push the knife away from your body while pulling the skin to maintain tension. Continue until the fillet is free. Flip the fish over and repeat the process to remove the second fillet. Put the fillets in a plastic bag for transport. Discard the carcass in the water and sanitize your hands after cleaning the fish. Sharp fillet knives are a danger and require extreme caution. Always point the blade away from your body and free hand while cutting.